Title: 'Sarmatia'. From 'Notitiae Orbis Antiqui', 1705/06. 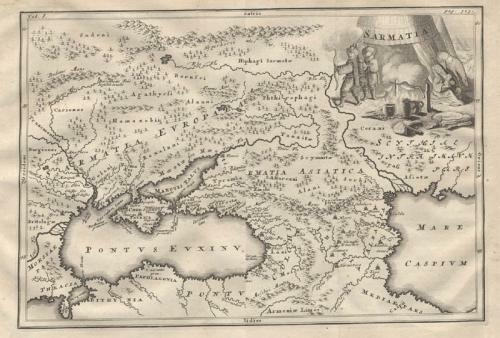 Interesting regional map of the area around the Black Sea and the Caspian Sea, based upon ancient geography. From an early edition of Cellarius' Notitia Orbis Antiqui, Sive Geographia Plenior...et Novis Tabulis Geographicis, which was published in London, Amsterdam and other places over the next 100 years and was one of the most popular Ancient Geographies of its time. The map is in good condition with folds as issued. There are no discernible faults except for an overall age toning.